This attractive, beige-brick apartment house in Carnegie Hill has a superb, quiet location across from the reservoir in Central Park and a block north of where most parades terminate on Fifth Avenue. The 87-unit, cooperative building was erected in 1950 and designed by George F. Pelham. One block south of the Guggenheim Museum, this building has a very attractive dark polished granite entrance and a garage on the side-street. A major supermarket is one block away on Madison Avenue and the Carnegie Hill area has some of the citys most important museums, finest schools and loveliest churches. Many of this buildings handsome balconies have been enclosed over the years to enlarge apartment living rooms. Such enclosures compromise the building's original architectural integrity and raise serious zoning questions as they had considerable more interior space to building without providing any additional public amenities for such an important bonus. It is not the only building to have had some many balconies enclosed on Fifth Avenue, but the practice is highly questionable and should have roused the ire of the city's civic watchdog organizations that appear to have been uninterested, uninformed and/or blind to these actions that make a mockery of the city's regulations. The building has a quite rhythmic facade of indentations and projections. 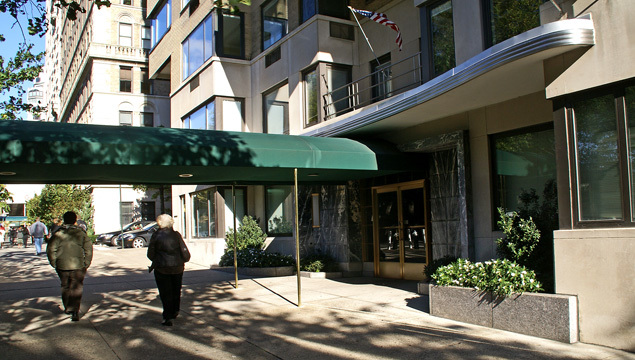 The building has excellent views of Central Park and is across the avenue from a local downtown bus stop and there is excellent Cross-town bus service one block away at 86th Street. The building has a concierge and a doorman and a garage, but no sun deck and no health club. It has a canopied entrance with a large curved stainless steel marquee and a handsome polished gray marble entrance surround as shown in the above photograph. It has a two-story limestone base and many corner windows. The building was erected on the former site of the James Speyer mansion, which had been willed to the Museum of the City of New York. "The principal features of Pelham's generally bland nineteen-story, beige-brick block was the placement of a one-story parking garage adjacent to the building along Eighty-seventh Street, which guaranteed light and air to the rear apartments and fostered the appearance of a freestanding tower, as Raymond Hood had done in his American Radiator (1924) and Daily News (1929) buildings. The arrangement was widely studied by developers and planners, particularly as the City Planning Commission began to consider revisions to the zoning ordinance that would reduce allowable bulk to insure more light and air for surrounding streets. The building's principal facade combined cantilevered and recessed terraces in a syncopated composition that was more visually chaotic than interesting. The editors of Architectural Forum observed that in an 'effort to assuage the city dweller's hankering for a front porch all his own, space is snipped from the living room to allow for patching in a petite balcony.' The lobby was designed by Beryl Austrian to evoke, as the decorator put it, 'the spirit and character' of the demolished Speyer mansion."